It’s no surprise that hiring a full time social media employee increasingly seems to be a luxury a small business or non-profit can’t afford (see our past social media blog post here). Benefits and lack of comprehensive ROI measurements, you’re talking about $46,000 to $71,000 for a Social Media Specialist alone. How long will that compensation level last? That explains why outsourcing has risen 128% in only two years. It just makes sense to the bottom line, allows for greater flexibility (freelancers can tweet at 11:00 PM at night! ), and free’s up some company cash to focus on mobile or social advertising, a smarter, more measurable investment. 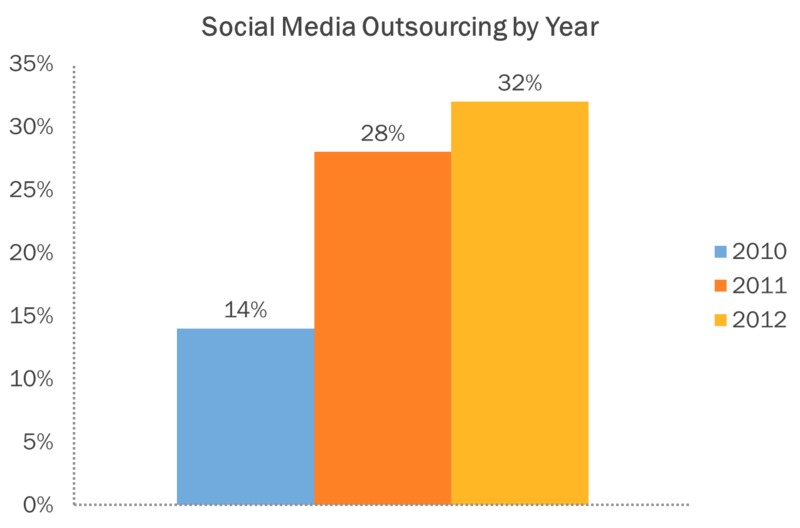 Read on to see the statistics and the pros/cons of outsourcing your social media. Social Media Examiner’s Michael Stelzner is releasing his 2012 State of the Social Media Marketing Industry report today after his 1:00 PM EST webinar with HubSpot’s Content Strategist Kipp Bodnar, where the two will review all the juicy data. Part of Michael’s research included asking social media marketers whether they’re outsourcing any of their social media marketing tasks, and if so, what specifically they’re outsourcing. Turns out, in 2010, only 14% of marketers outsourced social media marketing. Last year, that number doubled to 28%. And this year, the percentage rose yet again, with 32% of marketers outsourcing social media. It’s not exactly “news” that marketers are strapped for time, so when budget allows, it can be a huge relief to outsource activities to reputable agencies or contractors. But if you’ve spent any time on Twitter, you’ve probably seen more than your share of social media “experts,” “gurus,” and “ninjas.” In other words, it’s really easy for a marketer to get sucked in by contractors or agencies that might not be qualified to manage their social media presence. So let’s break down the activities social media marketers have decided to outsource, and examine the pros and cons for outsourcing the most popular activities that show up on the list. That way, if you do decide to outsource, you know what to look out for so you actually see ROI on your outsourced social media spend. 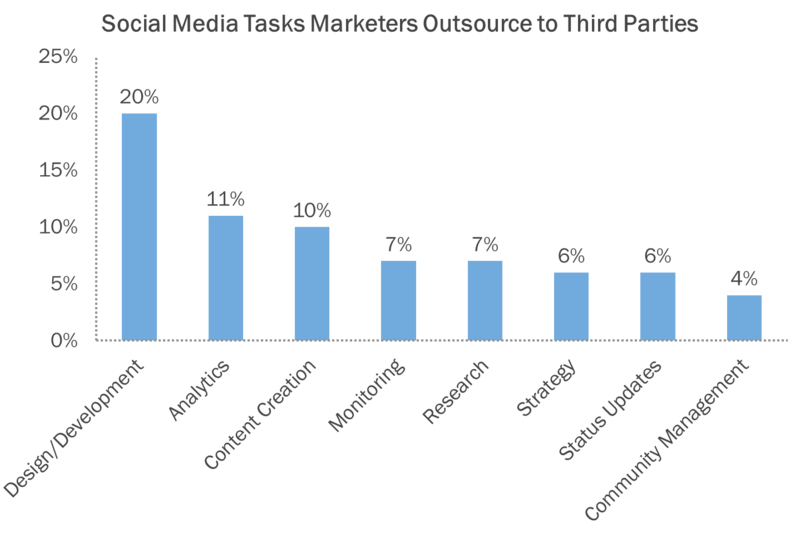 So, what are social media marketers outsourcing? Let’s take a look at the research from the report! An interesting point of data the report uncovered is that social media marketers with 3 or more years of experience are 23% more likely to outsource design and development tasks than beginners. And according to another report we recently released — the State of the Online Marketing Services Industry — 83% of agencies offer social media services, with 7% planning to add it in the future. So are these outsourcing choices a good idea? 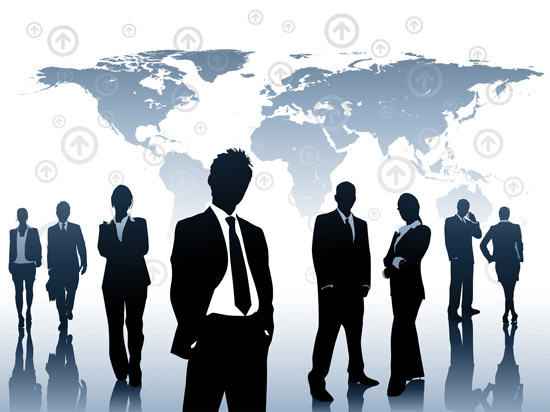 What troubles might a marketer encounter by outsourcing any of these tasks? If you’re considering a third party for any or all of these tasks, consider these pros and cons first that will help you do your due diligence. Design and development is one of those tasks that often plagues marketers. Some of us are analytical, some are content creators, some are graphically inclined — a lucky few are all three. But it makes sense to seek a third party for design and development work who has more expertise in creating a beautiful design (just like you may have done for your website). More importantly, it’s one-time or infrequent work that doesn’t require ongoing maintenance. There’s relatively low risk in asking an agency, firm, or contractor to do your social media design and development. Unless, of course, you are so active in social media that you’re making constant changes and updates. Social media is changing quite frequently — just look at the new Twitter brand pages, the evolution of Pinterest, Facebook’s new page layout, and the release of Open Graph applications. Visual content is becoming more important for a social media strategy, brand pages are gaining new functionality and changing layouts, and if you’re really sophisticated, you might be experimenting with Open Graph. If you’re truly leveraging all of the new updates that come out, it may make sense to have a designer or developer on staff to help you respond quickly. But, all in all, having design and development managed by a third party is quite low risk. The State of Social Media Marketing Report showed that the number one question asked by marketers — for three years in a row, actually — was how to measure the ROI of social media marketing efforts. If marketers aren’t sure how to do this, it’s no wonder social media analytics is being outsourced to a third party. The problem is, the success of this is largely reliant on two things: the tool being used, and the person analyzing the data. We’re obviously a big fan of using our own software to analyze the effectiveness of our social media marketing, because it offers closed-loop reporting. That means instead of just looking at how many likes, follows, or retweets you receive, you not only know whether you’re generating leads from your social media networks (and on which networks you do so most effectively), but also whether those leads turn into customers, and at what rate. But because marketers are so confused about how to measure social media’s ROI, it’s certainly easy to be duped into using an agency’s proprietary or third-party analytics tool that may have tons of fancy graphs, lots of numbers, and export complicated spreadsheets — but it really doesn’t tell you how to do anything actionable to improve your social media marketing with that data. So if you’re considering using a third party for social media analytics, make sure that their tool not only offers closed-loop reporting, but that the person analyzing the data can also tell you how to use that information to improve your marketing strategy. You need content to fuel your social media strategy, but it requires a high time investment that many marketers don’t have — perhaps one of the highest time investments of anything on this list. So it makes sense that content creation is outsourced. Go for it! Hire someone to create great blog content, ebooks/whitepapers, videos, and infographics that will make your social media presence valuable for your followers! But start slow — ask for some writing samples and test content before committing to a large content creation contract. Just like there are many social media ninjas out there, there are plenty of freelance writers that may create subpar content or leave you hanging on a deadline. We’ve written a blog post about how to screen freelance writers if you’re considering going that route; but if you hire an agency, it’s likely the writers have been screened in advance. Just make sure you ask for samples that relate to your industry before putting pen to paper. Social media monitoring can be a laborious chore at best, and a distracting one at worst — depending on the size of your following and what you use social media for. HubSpot, for example, has a social media following across accounts of about 318,000. We use those accounts for publishing content, talking to followers, and customer service triage. And we keep monitoring in-house, because we’ve found a way to do so without taking up much of our day (which we’ve shared with you in our ebook about Monitoring Your Social Media Presence in 10 Minutes a Day). That being said, there are challenges that other businesses are faced with that make outsourced social media monitoring a logical solution. For example, international businesses or those that never really “close” may be receiving tweets 24/7. And it doesn’t look good when a serious customer service question can’t be answered in a timely manner, nor is it a pleasant working environment for a community manager who is constantly checking for customer service issues at all hours of the night. For businesses of this nature, outsourced monitoring makes sense — but only to agencies that truly understand your values and how you want to communicate with customers. We’ve covered what can happen when your agency doesn’t monitor social media for complaints in our post about AT&T’s Twitter SPAM snafu. If you choose to outsource monitoring, monitor your agency in the beginning, too. I’ve combined “Research” and “Strategy” because, frankly, you can’t have one without the other. And just like social media analyzing is a common problem for marketers, many have also expressed confusion over how to create a social media strategy. The strategy is posting updates, right? Wrong — and if you have an agency that is telling you that, run away fast. Posting updates is a tactic (which we’ll cover in the next section!) that helps you achieve a larger strategy. And a great consultant or agency will help draw that strategy out of you through diligent competitive and industry research, getting to know your business, and talking to you about your marketing and business goals. Then they should be able to outline a detailed plan for you about how to achieve that strategy — that either you, their staff, or another third party — can execute. Is your consultant or agency asking you what your big picture goals are? 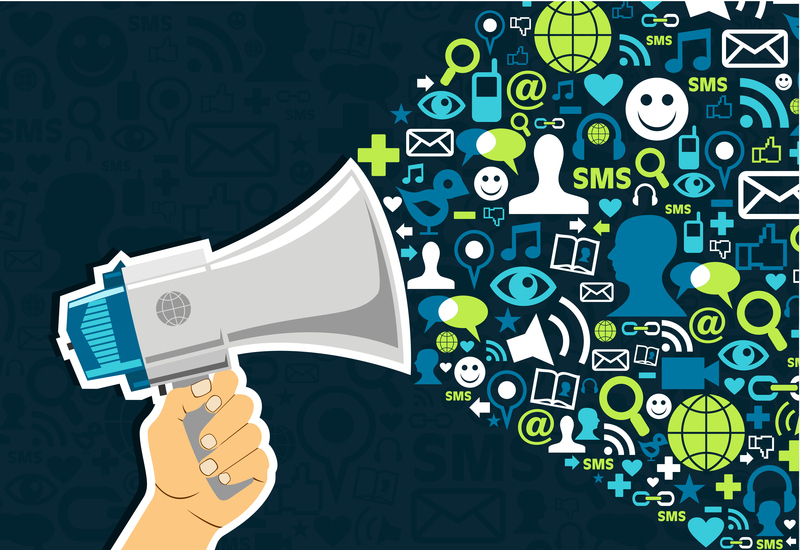 Do you want to generate more leads, and think social media could help you do that? If so, what kind of leads? How will you nurture those leads after they’ve been generated? Or perhaps you need to improve your brand’s public image, and you think social media can help you do that. Will they be able to give you actionable advice on how to use social media as part of a larger branding strategy that differentiates yourself from your competitors and integrates with your other marketing activities? If these are the types of discussions you’re having with a third-party research and strategy provider, you have probably found a reliable consultant. But as we said before … beware the “ninjas” and “gurus” who can’t truly provide actionable advice that integrates with your larger marketing strategy. Status updates are easy to integrate into your daily social media monitoring, especially if you take time out each week to schedule posts across all accounts using tools like HubSpot’s social media bookmarklet. If you’re already outsourcing your monitoring, ask if you can also integrate automated updating as a service. But this task is so simple to work into your day — especially since you’ll likely be publishing custom content, too — that a marketer on a budget could probably get more value spending their dollars elsewhere. While social media monitoring can be outsourced successfully when the proper protocol is in place, I believe community management is best left in-house — so I’m glad to see it as the least frequently outsources task on the list. While social media monitoring can simply be alerting the proper internal parties of a problem that arises on social media, community managers have a personal relationship with many members of their social media networks. Successful community managers identify influencers, get buy-in on controversial changes as a trusted member of the group, and often engage offline with many of their contacts. The level of trust required to be a community manager is often diluted if fans and followers learn they’re dealing with an “outsider” from an agency. If you’re looking to fill a community manager position, your networks will have an easier time accepting someone from the inside. Jewish Social Media 101 – To Hire or To Outsource Jewish Social Media? You Decide! Bear in mind also that many Jewish non-profits and schools are still focused on traditional methods of Jewish marketing & communications. Which is why advertising in Jewish print media has continued to remain stable while digital & social marketing lags behind. The extent of Jewish social media is the community shul listserve, such as Yahoo Groups or Google Groups, which is a textual Craigslist type of community bulletin board. Jewish social media groups have attempted to pop up though most are merely groups within Facebook & Linkedin. As a result, social media as a career hasn’t taken off in the Jewish marketplace, except as a freelance option. Overall, the smarter choice is to outsource your Jewish social media (social media outsourcing rose 128% last year) to freelance experts who don’t require full-time employment but can do the job equally well. Using the outline of salaries and need for social media strategy, you can judge your need and decide what tasks you can outsource and what tasks to keep in house. Reposted from Onward Search, a Social Media Recruiting Firm. Jewish Social Media 101 – Jewish Non-Profits and Social Media: Do They Get It? Here’s an excellent blog post from Rabbi Jason Miller that illustrates the need for Synagogues and Jewish non-profits to do more than take the easy way out of performing social media. Key line regarding volunteers: “you get what you pay for.” And if you’re not paying, you’re probably not getting the best Jewish social media experience possible. Jewish Non-Profits and Social Media – Do They Get It? Are Jewish Non-Profits adding social media to their arsenal of marketing tools? Cross-posted to Blog.RabbiJason.comAs a rabbi who is a social mediaologist, I find myself consulting a lot of synagogues and Jewish nonprofits on their social media strategy. 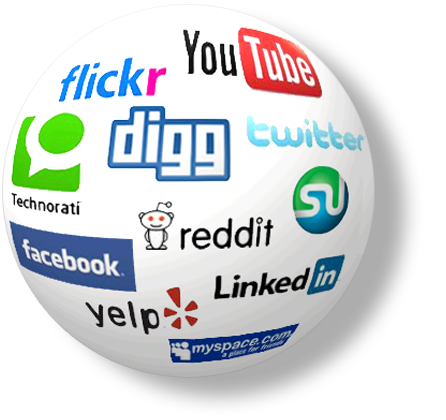 The leaders of these institutions all recognize that they require a social media strategy, but the plan for how it will be implemented varies greatly.Many synagogues in 2012 have yet to budget for social media marketing so they look for the quickest and cheapest solution. In most cases this comprises of identifying a volunteer lay person or existing staff member who is willing and able to set up the congregation’s social media presence across the major networks. In some instances this is a teen who claims to be a Facebook wiz and over-promises and under-delivers. With many volunteers, congregations often get what they pay for. Jewish organizations seem to be a little further ahead than synagogues in the social media department. Third party retailers like Target and Home Depot have forced nonprofit institutions to get on the social media bandwagon quickly because of their online contests in which the retailer partners with nonprofits for fundraising prizes. These crowd-raising initiatives have required nonprofits to bolster their social identity online to compete in the contests. While businesses in the for-profit world have allocated serious funds to their online marketing initiative, the nonprofit world is still light-years behind. That should be no surprise because nonprofits often take a wait-and-see attitude when it comes to change. Facebook reports that 89% of 1.3 million U.S. nonprofit organizations boast a social networking presence, offering opportunities potentially for fundraising. However, fundraising on Facebook is still a “minority effort,” despite recent gains. The authors of the study recognize that the Jewish nonprofits that have succeeded the most in social media marketing have been those that have participated in social fundraisers with third parties, such as mega-retailers or major foundations. Many organizations that find themselves competing in these online social fundraisers have allocated staff time or in some cases hired dedicated part-time staff to manage these initiatives (if they win there is a good return on investment). The Jewish Education Project and JESNA’s Lippman Kanfer Institute (in partnership with UJA Federation of New York) have launched the Jewish Futures Competition, which will dole out $1,800 prizes for Jewish nonprofits to advance their social media identities. As more synagogues and Jewish nonprofits become more focused on bolstering their social media exposure (moving from building their fan base on a Facebook page to increasing their brand amplification through likes, comments and shares), they will integrate their email marketing (Constant Contact, MailChimp, etc.) and online fundraising (Razoo, CauseCast, DonorPages, etc.) into their social networking. Evans and Lapin’s study demonstrates that nonprofits do understand the value in using social networks for fundraising. “According to this year’s Nonprofit Social Network Benchmark Report, four out of five nonprofit organizations find social networks a ‘valuable’ fundraising option.” However, these same nonprofits aren’t able to quantify why that is. It is important to remember that social media is still in its infancy. As it grows (and its exponential growth doesn’t seem to be slowing down any time soon), more synagogues and nonprofits will get on board by allocating the necessary resources to its success. As they say, the “proof is in the pudding” and the ROI will be noticeable for the synagogues and Jewish nonprofits who dedicate the necessary time and resources to building their brand/mission exposure through social media. Change is never easy and the nonprofit world is more risk averse when it comes to technological innovation. At least the conversations about social media integration are taking place in the Jewish nonprofit world, and the studies are showing that a realization exists that this is a necessary form of communication, marketing and fundraising in the 21st century. Rabbi Jason Miller is an entrepreneurial rabbi and technologist. He is president of Access Computer Technology in Michigan and blogs regularly at Blog.RabbiJason.com. Follow him on Twitter @rabbijason.